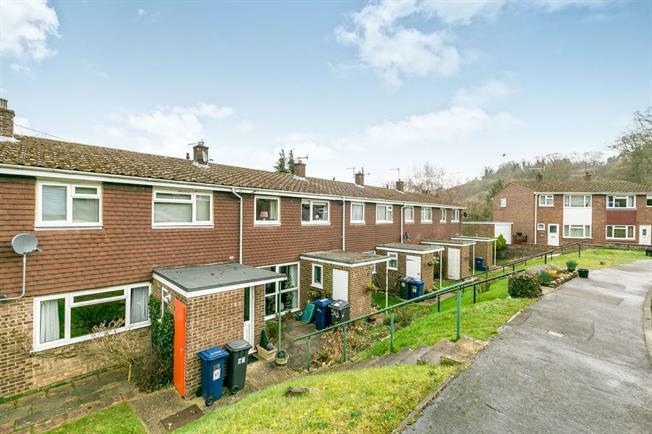 3 Bedroom Terraced House For Sale in Godalming for Asking Price £365,000. This well presented and immaculately kept three bedroom terraced house is located close to the centre of Godalming, within walking distance of the station. The accommodation comprises a generous living room which leads through to the dining room, where glazed double doors open into the conservatory. The kitchen is fitted with a range of Shaker style eye level and base units, with space for all the usual appliances. On the first floor there are two double bedrooms with fitted wardrobes and a third single. The family bathroom is fitted with a contemporary white suite within fitted units. At the rear there is an enclosed garden, which is mainly laid to lawn. There is a garage in a detached block.